Rx60 is a 6 channel (1.3A ESC, 5 aux chan) DSM2/DSMX compatible micro receiver designed for use in surface vehicle: cars, boats and train locomotives. The receiver is designed to operate from 3-13v DC. This allows it to be used with many battery combinations. 1S, 2S and 3S lipos are common choices (3S = 3 cells in series), 3-8 NiMH or a PP3. The motor output (H1) can supply up to 1.3A when the motor is stalled at 100% throttle. 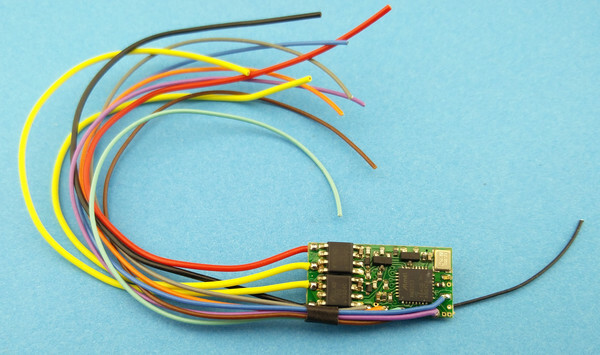 The receiver is available as a bare board with 2.54mm pad space for ease of soldering and as a wired version. The latter has lead-out wires installed for battery and motor (H1). Rx60 is intended for surface vehicles which require forward and reverse motor control. The H-Bridge bidirectional motor output is abbreviated H1. The H1 ESC (Electronic Speed Controller) has 256 step resolution in both directions (512 total). It controls speed with PWM which by default is set to its fastest (quietest) 16kHz setting. The H1 configuration is determined by the selected receiver variant - see the Variants tab for details of each variant. The default for variants -2 and -22 is to control both speed and direction using channel 1, which is the throttle knob on Tx20, Tx21 and Tx22. If you prefer a full-range throttle control on channel 1 with separate direction switch on channel 3, then select the 'full-range and dir switch' option when specifying your receiver. The H1 output can handle up to 1.3A current without heat sinking at voltages between 3 and 13V. Current is measured with motor stalled. The main constraint with current is heat in the receiver. Higher currents may be possible if a heatsink is added and is helped with the 120Hz PWM frequency. It should be possible to use it a little above 13V but this would require lower motor currents and/or heat-sinking. Induced voltages may be higher than the power source so it would not be wise to try to use it anywhere close to 20v. P outputs are 'pads' with 'logic' or type outputs. Pads are simply solder points for controlling external things. Logic outputs are either on or off (also known as high/low and 3.3v/0v in voltage terms). The action can be inverted so 'On' can mean 0v or 3.3v. P outputs may also used to provide servo signals direct to the white/yellow lead on a servo. P outputs can be used to directly control triggers on external sound cards. They may also used to drive LEDs with a series resistor to limit current to no more than 20mA. The behaviour of a P output can be configured by programming the receiver. The Rx60 receiver is available in 7 variants to suit model usage and type of transmitter. 'Variants' are simply 'configurations' or combinations of receiver settings to match common needs. Although these are described as 'car/train/boat', any variant can be used for anything. All receiver settings can be changed in a process called 'programming'. All versions of the Rx60 are the same hardware, the only difference is the program settings. The Rx60 settings can be changed in the usual fashion via waggling the sticks of a stick-type Tx or the PROG3 / PROG4 programmer may be used. A guide to Rx60 programming using a stick-type Tx is available here. The 'Direction' feature in the table above indicates whether the receiver ESC uses the throttle (chan 1) as a centre-off or full-range control. Centre-off is the default setting for most variants. When configured for full-range (by programming), a seperate channel is used to set the ESC direction - this is channel 3 for the Tx2x controllers. 100mm lead-out wires on power, motor, L input and all P outputs.